Sorry... the 2017 Volkswagen Golf GTI is no longer being sold as new. Instead, take the first step to a great deal on 2019 Volkswagen Golf GTI with a free price quote! The 2017 Volkswagen Golf GTI comes as a 2- or 4-door hatchback. It competes with the Ford Focus Mazda Mazda3, and Hyundai Veloster. 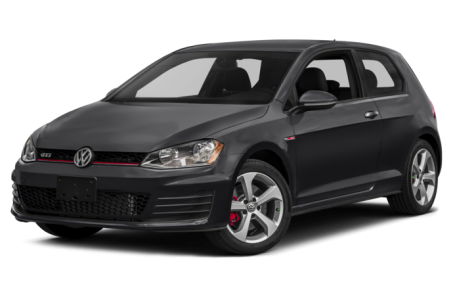 This year, the Golf GTi has simplified its trim levels and added a new Sport trim. Now standard for the Sport and higher trim levels is the Performance Package, which includes larger brakes, a limited-slip differential, unique 18-inch alloy wheels, and Bi-Xenon headlights. Three trims are available for the 4-Door GTI: the S, Sport, and SE. The 2-Door GTI only has an S trim. The Golf GTI is subtly distinguishable from the regular Golf. The most immediate difference is the thin red stripe running across the grille and headlights on the GTI. The front grille and fascia have a unique honeycomb-mesh pattern. The front fascia also has aggressive-looking strakes on its outer air vents. LED front fog lights, power/heated side mirrors with turn signal indicators, a dual pipe exhaust system, and 18-inch alloy wheels come standard. Under the hood, the Golf GTI is powered by a standard 210-hp, turbocharged 2.0-liter 4-cylinder engine mated to a 6-speed manual or dual clutch automatic transmission and all-wheel drive (AWD). Fuel economy for the Golf GTI is an EPA-estimated 24/34 mpg city highway. Inside, the Golf GTI has a premium cloth interior with plaid-pattern seats and a 60/40 split-folding rear seat. The center stack features a standard MIB II infotainment system with a 6.5-inch touchscreen, Bluetooth connectivity for phone and audio, and a USB port. It can be upgraded with an integrated navigation system and a Fender premium audio system. Standard features include air conditioning, cruise control, power windows/locks, remote keyless entry, and heated front seats. Leather upholstery, a power moonroof, automatic dimming rearview mirror, power front seats, and push-button start are also available. Standard safety features include a backup camera, a tire pressure monitoring system, and Volkswagen’s post-collision braking system. The available Driver Assistance System includes adaptive cruise control, forward collision warning, autonomous emergency braking, a blindspot monitoring system, rear traffic alert, front and rear park assist, and lane departure warning.